Patricia McConnell wrote on her blog about her frustration that most bookstores place The Education of Will with the pet books. She’s right. It’s only partly a dog book; a wonderful dog book, by the way. It’s also a memoir. But far more powerful than either of those, it’s a book about overcoming trauma, understanding how experiencing trauma affects every aspect of the survivor’s life and behavior — and gathering the courage, compassion, and forgiveness to face the trauma and heal. 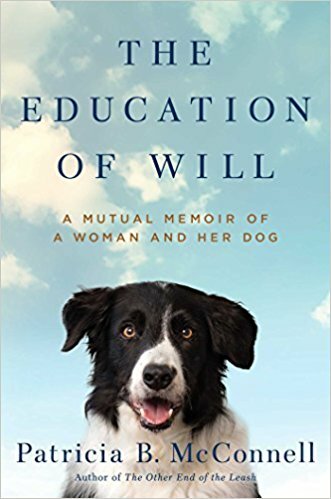 Though chock-full of stories about Will, Dr. McConnell’s troubled border collie puppy, and sprinkled with tales of other traumatized and terrified dogs she has helped over the years, The Education of Will is primarily Dr. McConnell’s story. It is deeply personal; writing in is courageous and testament to her ability to examine the worst experiences a person can have, work through them, and share them in all their frightening, embarrassing, horrifying detail. If you’re a dog person, you should read this book — and Dr. McConnell’s other books, her blog … If you are a human being, you should read this book. If you’re a dog with fear-based behavior problems or a dog who’s experienced trauma, you should read this book (ask your human to help). Will, as an eight-week-old puppy, reacted to sudden noises with explosive terror. Dr. McConnell has no explanation for this; he did not, as far as she knows, experience any trauma in his first weeks. He was terrified of other dogs, particularly if they were inside his house. However, he adored any and all people. Her work with him was painstaking and slow; they experienced frustrating setbacks, as it is not always possible to control a frightening environment and avoid noises, dogs, injuries, and any previously unknown triggers. As I read the first chapters, I wondered whether I’d have the patience and skill to work through problems like Will’s. I thought about how the agony of his early weeks and months affected his overall quality of life and that of Dr. McConnell’s other dogs. I wondered whether there are more than a handful of behaviorist or trainers who could cope with a dog like Will. I know that there are literally thousands of dogs like him. Unfortunately, many dog owners see the behavior of a dog like Will — lunging, barking, maybe snarling or even biting — as aggression. It often manifests as aggression, sure, but at its core, it is fear. In her work with aggressive and fearful dogs, Dr. McConnell had to face her own fears as well as convince the dogs’ owners that their dogs needed compassion and patience as they worked to overcome the fear underlying the dogs’ aggression. Too often when dogs act out, trainers perpetuate the myth that the dog is “being dominant” and that owners need to “be the alpha.” This approach only encourages responses, like yelling at the dog, hitting him, or administering leash corrections, that are likely to exacerbate the dog’s fear and escalate the aggression. Fearful and traumatized dogs need lots of patience, gentleness, and understanding, not violence or punishment. Some will recover; many will not. Will is so lucky to have landed with Dr. McConnell — as are the thousands of clients and dogs she’s helped throughout her career. This is the best dog book and non-dog book that I have read in a long time. In case you are still wondering where I stand: Four paws up. Read this book! ← Are Raw Diets Safe? I was excited when I saw she’d written another book. I’ve got to get it!